Suiyam, susiyam, sugiyam, suliyam, seeya are all different names for these crispy, sweet balls. They are crispy on the outside and soft on the inside. You can make these for any festivals or even as a tea time snack. 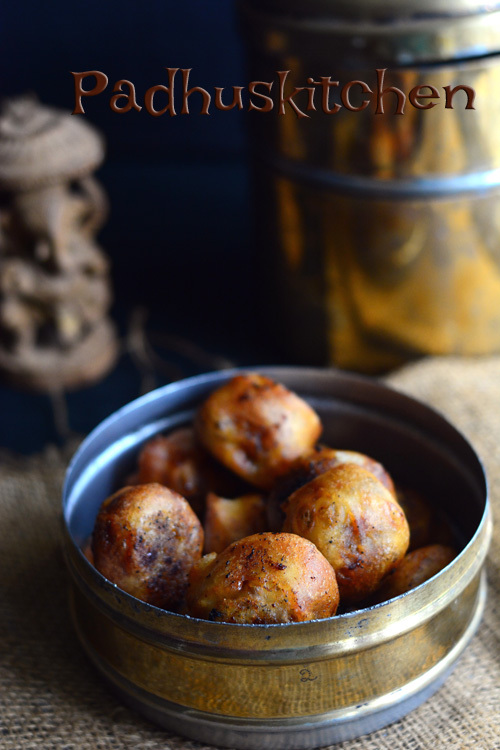 We make these with boli filling (chana dal and jaggery) or this coconut jaggery filling. This is more tastier than the bengal gram filling. It is very easy to make and also tastes delicious. Today we will learn how to make sweet sugiyam following this easy recipe with step wise pictures. Soak rice and dal for 3 hours. Grind it to a smooth paste with very less water. Add salt and mix well. The consistency of the batter should be thick and flowing, so that it will coat the coconut-jaggery balls well. Now we will make the coconut jaggery filling. You can prepare this the previous day and refrigerate it. In a kadai or any heavy bottomed vessel, add grated jaggery and 2 tbsp of water. Heat and stir, for the jaggery to dissolve. Then filter it to remove any impurities. Now boil the filtered jaggery water until it thickens. (if you add a tsp of jaggery syrup in a cup of water, the syrup should not dissolve in water). At this stage, add a tsp of ghee and grated coconut. Cook on medium heat stirring continuously until the coconut mixture thickens. Add cardamom powder and mix well. As the mixture cools, it will thicken further. You should be able to make balls out of the mixture after it cools. If you cannot make balls, you have to cook for few more minutes. Once the coconut jaggery mixture cools, divide it equally and form balls from it. Now the batter and the coconut jaggery balls are ready. Heat oil in a kadai, when the oil is hot, reduce the heat to medium. (to check if the oil is hot, drop a little batter into the oil, if it raises to the surface immediately, the oil is ready for frying). Coat the coconut jaggery ball with the batter and gently drop it into the oil. You can drop 3-4 balls depending on the quantity of oil. The balls have a tendency to get stuck at the bottom of the pan. Do not panic. Once it gets cooked slightly, flip it over to the other side gently. Fry until light golden brown and place it on a colander or paper towel to absorb excess oil if any. Repeat the process for the rest of the balls. Sweet suiyam is ready. Enjoy it warm. Check out more Vinayaka Chaturthi Recipes. It is not aluminium, it is hindalium. You will get it in all vessel shops. Try in rathna stores or ananda stores. Dear padhu....ur recipes are awesome. I always refer your site for cooking. please add step wise pictures to all recipes so that it will be easy to beginners like me. Just a doubt can v prepare raw rice paste from store brought raw rice..
You have to soak rice and grind. Check my instant wheat appam recipe.